and that eye … bald ..
Hi Roz, it just made itself and is a good start for Crow Book 3! Habu Textiles in New York make the black paper moire twisted into black linen thread, isn’t it fabulous? That aint no goat eye! Hi Di, you’re right, it’s not an antique agate Dzi Bead from Tibet also known as a Goat’s Eye and it’s certainly not from Madagascar! I bought a string of these lovely eye beads from the local bead shop in Leichhardt and would say it's most probably made in China or India by a clever anonymous flame worker. It has a round pupil rather than a rectangular one but so do the antique ones I have found online here’s a link but it’s valid as my version of a miraculous goat’s eye bead and it is helping the Crow Book 3 materialise, so it’s doing it’s job + I have wanted to make one ever since I first read that quote 10 years ago! NB it looks like an Australian Raven’s eye which makes it more magical for the making of Old Man Crow’s next book and I could change the name of this post but would lose the chance to use that quote! Hi Dotti, in other words the goat’s eye beads are deemed particularly magical because they can bring the wearer things that miraculously do not exist. i love this .. i also love making eye beads . just something about eyes . you do flame working too Kathy? hmmm… could you make me one? that would be real magic! Mo, I like this amulet very much, and am wondering just what kind of things it might bring the wearer… can you give me an example of “things that do not actually exist” – hehe?? 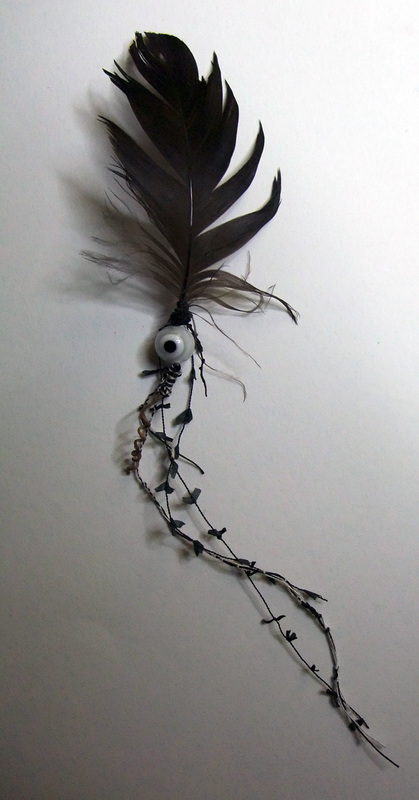 There is something so satisfying about the flare of the black feather, the hard roundness of the Eye, and the trailing strands of nubby string. It looks magical for sure. I’m glad its working. it’s got that old mojo working hehe! this one is an eye for leaping into the unknown with! i’m thinking Goats and Ravens can shape shift…the pupil of the eye would then change…. depending on what “work” there is to do…. you make the greatest stuff…………..
Hey Grace! your xroads cloth was the key to the making of this Goat/Raven eye amulet! I was having the devil’s own time all day on Friday trying to get Old Man Crow’s Book no3 happening, he suggested his Smoking Man drawing could be translated into a thread drawing for the back cover & I was thinking of inlaying that crow feather into the leather on the front and maybe stitch the shadow but nothing was gettin’ there, every idea was coming out still born… dead on arrival… then I was just looking at that crow feather and crow eye bead and the tiny grape vine tendril laying on your xroads cloth & I was taken by that tiny dot in the square on the right edge… it was in that moment I remembered the quote about the goat’s eye beads and that aha moment happened, Magic Days! don’t know what to say. just looking.